Copyright © 2002 by Gary A. David. All rights reserved. No photos may be used without permission. 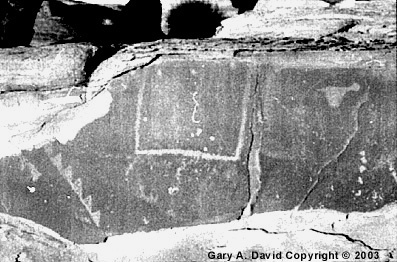 Is this the depiction of a triangular aerial craft, a version of the Hopi paatuwvota, or "flying shield"? Is the figure on the right an Egyptian hedjet crown (front toward bottom), or is this just a coincidence? Is this a blue heron stabbing a human? Note the pyramid shape below and to the left. Compare this with the phoenix sitting atop the benben stone at Heliopolis in Egypt. 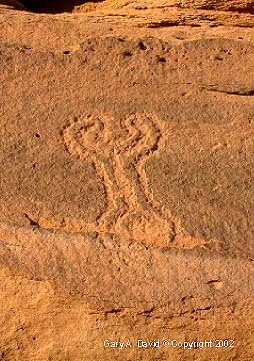 Is this petroglyph symbolic of Orion, with the upper portion representing the belt stars and the lower portion the sword? 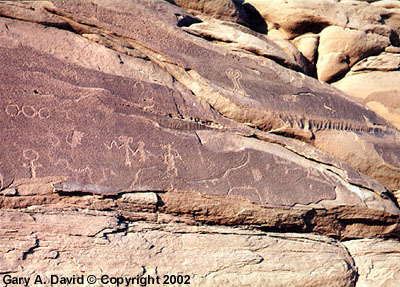 The petroglyph to the right may represent the eye of Sotuknang, the ancient Hopi sky god. This vertical stemmed ogam possibly spells F-D (marks on the right represent F, marks on left represent D). Old ogam (800-300 BC) lacks vowels, so this word is actually fad, meaning "distance." [Source: Barry Fell, America B.C. Ancient Settlers in the New World (New York: Demeter Press, 1977, 1976) p. 194.] Has the actual distance number been rubbed out for some reason? Script at lower left of photo may be signatures of emigrants, but further research is needed to establish this. 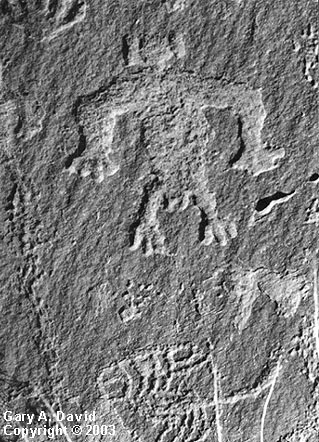 This petroglyph near Winslow, Arizona carved probably about the late thirteenth century shows a female with poli’ini, or butterfly hair whorls (sometimes misdesignated as squash blossoms) on each side of her head. This photo link to the Cline Library Image Database at Northern Arizona University shows an early twentieth century young Hopi maiden from the First Mesa village of Sichomovi with the same characteristic hair style. These hair whorls or disks were sometimes represented by the Maltese cross, a symbol of fertility or virginity. 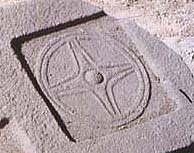 (Both whorls from each side of the head are laid across each other at right angles to form the cross.) Of course, the Maltese cross is a Knights Templar emblem. In Mexico it is known as the Cross of Quetzalcoatl. It also occurs on pottery from the fourth millennium found at Susa, the capital of Elam (the biblical Shushan in present-day western Iran). At the far left is the alchemical symbol of Venus. Above that are three circles connected by two horizontal straight lines. 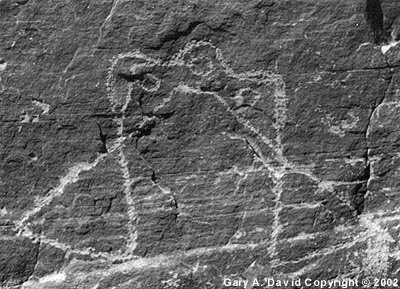 In his book The Rocks Begin to Speak, LeVan Martineau (Las Vegas: KC Publications, Inc. 1994,1973) states that two circles connected by a line signifies communication. 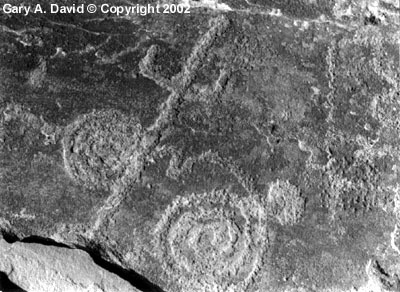 Perhaps three circles suggest communication between the three figures to the right. Martineau also believes that zoomorphs do not necessarily represent horned animals but may instead connote direction. In this case the horns on the animal are pointed downward toward the snake. Does this mean that the three figures made a journey to the Underworld or spirit world? 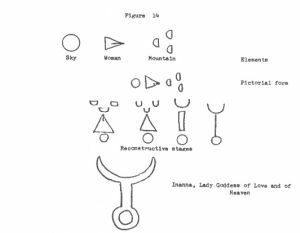 The fact that this petroglyph (left) appears on the top of the same panel that has a Venus alchemical symbol reinforces the notion that this icon represents Inanna, goddess of fertility and love in Sumer and Dilmun (or Tilmun, now called Bahrain). 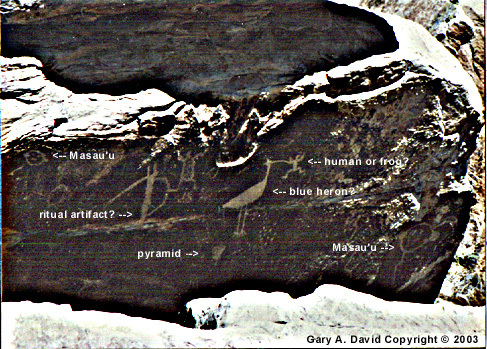 Note what appears to be a triad of three natural holes above and slightly to the right of the petroglyph. Although inverted from the usual position shown in Dr. Bushiri's work (right) to represent "mountain," this triangle of holes may mean the same thing.
. 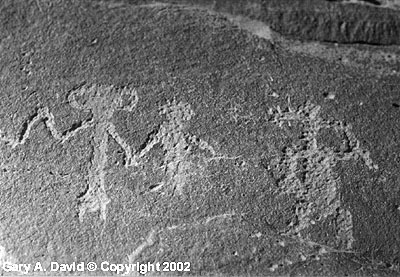 The ET-like figure on the left is possibly Masau’u, Hopi god of death and the Underworld, holding hands with a human. 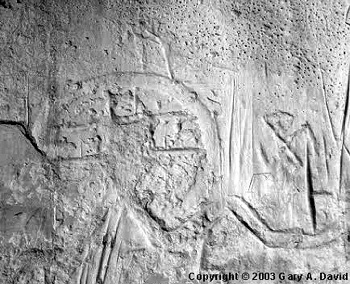 The figure on the right may be a Soyoko (Ogre) Katsina, who has a snout with sharp teeth and a baton or bow in his left hand. 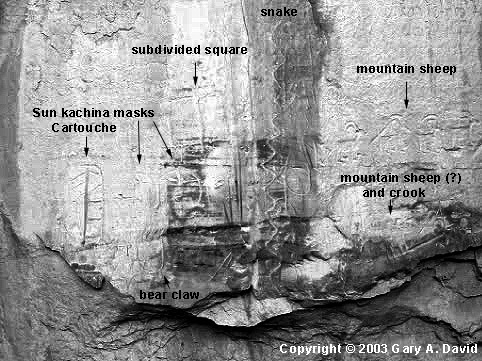 This along with the Hu (Giant) Katsina found in Hopi cosmology point to the possibility that "giants in the earth" (Genesis 6:4) roamed northern Arizona. but was also used in China. Although the recent Hollywood movie "The Mummy Returns" shows two scantily clad female combatants of ancient Egypt using trident-like truncheons, this weapon is actually of Japanese origin. 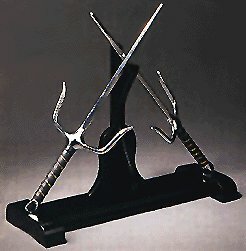 The sai is a blunt martial arts weapon used to deflect swords but may have developed from a farming implement employed to make furrows. 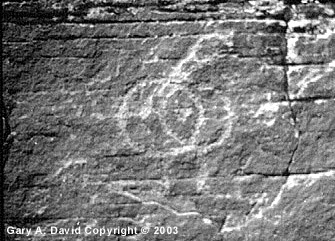 This petroglyph from northern Arizona shows the spiral on the left touching the instrument, its power continuing across the line to the spiral on the right. 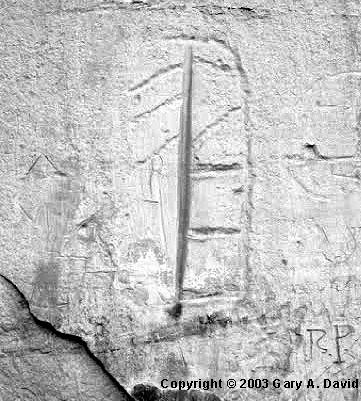 In rock writing the spiral represents a whirlpool or whirlwind but it also signifies a portal, vortex or interdimensional space of numinous influence. A counterclockwise spiral refers to descending movement while a clockwise spiral means ascension. Perhaps the spiral on the left energizes the instrument whose origin is the Underworld. On the right-hand side the line of force dips (energy pauses?) 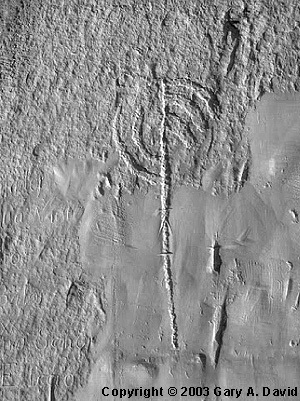 before rising to the Earth's surface (the carved circle touching the arc at about a two o'clock position). 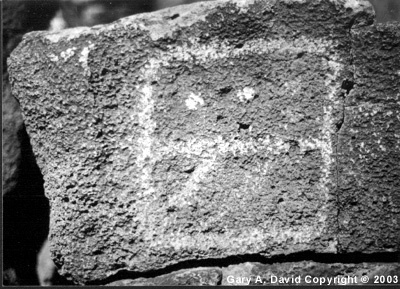 For more on a possible Japanese-American Indian connection, see The Zuni Enigma by Nancy Yaw Davis (New York: W.W. Norton & Company, 2000).